Russia's military intervention in Syria is helping to support the "butcher" President Bashar al-Assad, David Cameron has said. The prime minister said Russian forces were not discriminating between Islamic State militants and others fighting the Syrian president. Earlier, Defence Secretary Michael Fallon said Russia's "unguided" bombing in Syria led to civilian deaths. Russia said its aircraft had hit IS command centres and arms depots. US President Barack Obama has said Russia's strikes, which began on Wednesday, are "only strengthening" the IS position. Speaking in Oxfordshire, before heading to the Conservative Party conference in Manchester, Mr Cameron said Russia's military intervention was "really making the situation worse". "It's absolutely clear that Russia is not discriminating between Isil [IS] and the legitimate Syrian opposition groups and, as a result, they are actually backing the butcher Assad and helping him," he said. "Rightly, they [Russia] have been condemned across the Arab world for what they have done and I think the Arab world is right about that. "But we should be using this moment now to try to force forward a comprehensive plan to bring political transition in Syria because that is the answer for bringing peace to the region." Mr Fallon told the Sun intelligence suggested Moscow had mostly been targeting forces fighting President Bashar al-Assad rather than Islamic State militants. Russia's involvement would not prevent the UK from making a case for RAF strikes against IS in Syria, he added. Mr Fallon said initial Ministry of Defence intelligence suggested only one in 20 Russian air attacks so far had been on targets to damage IS. He said: "We're analysing where the strikes are going every morning. The vast majority are not against IS at all. Media captionUK Prime Minister David Cameron accused Russia of "backing the butcher Assad"
"Our evidence indicates they are dropping unguided munitions in civilian areas, killing civilians, and they are dropping them against the Free Syrian forces fighting Assad. He's shoring up Assad and perpetuating the suffering." Mr Fallon said Russian President Vladimir Putin's decision to become involved "has complicated the situation" but it would be "morally wrong" for the UK not to target IS in Syria, as well as Iraq. "We can't leave it to French, Australian and American aircraft to keep our own British streets safe," he said. Russia's targets included the IS stronghold of Raqqa, but also Aleppo, Hama and Idlib - provinces with little IS presence. 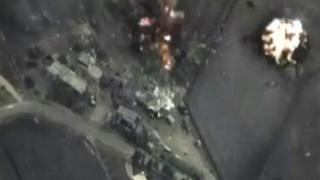 President Obama has said the Russian bombing campaign is driving moderate opposition underground. He also rejected the Russian assertion that all armed opponents of the "brutal" Mr Assad were terrorists. But Russian President Vladimir Putin has argued in recent weeks that his country's operation in Syria is designed to prevent the type of state implosion that took place in Libya after Nato's intervention there in 2011. Meanwhile, a former senior military adviser told BBC2's Newsnight the UK's policy in Syria had been hampered by "wishful thinking" about what would happen to President Assad's regime. Lt Gen Sir Simon Mayall said that UK policy makers had got caught up in the excitement of the Arab spring and hoped the Syrian leader would be swiftly overthrown, whereas the Russians had been "in many ways more realistic about the staying power of Assad".